As September faded away and October was welcomed once again, Hispanic Heritage Month made an appearance on campus. It comes once a year on September 15, lasting for an entire month. This is the second time HU was a host of this nationwide event, thanks to Daryl Singleton, director of multicultural affairs. Singleton and MAC (the Multicultural Activities Council) work together throughout the year to shine a light on different cultural projects, and October was the time for Hispanic Heritage Month to take the spotlight. This project became real thanks to the importance that Hispanics and Latinos have on the country as well as on the campus, with the population of both cultures being the largest minority group on campus. MAC’s goal is for people to feel included, to feel like they are part of the campus and for them to recognize and embrace their own culture while letting others do so, too. One of the events proposed by MAC and Singleton are the now-resurrected Spanish tables, a space every Friday from 11 a.m. to 1 p.m. at the D.C. for native and non-native Spanish speakers to communicate, learn about culture and practice the rusty Spanish that some left behind in high school. Another event that made its way to the HHM schedule was Taco Tuesday/movie night, with the Multicultural House as the selected venue. Authentic tacos where offered, as well as drinks. After attendees stuffed themselves, the Mexican movie “Instructions Not Included” rolled in, leaving the audience laughing and worried and shedding a couple of tears, ending a night filled with food, friends and culture. But the most anticipated event was the infamous tradition of the guac-off, which introduced Latin night — an immersion of Latin and Hispanic culture with dancing, music, food and a piñata. The idea of “Latin night” formed when Singleton and MAC members were discussing the idea of Mexico and Mexican culture being seen as the only Hispanic country. 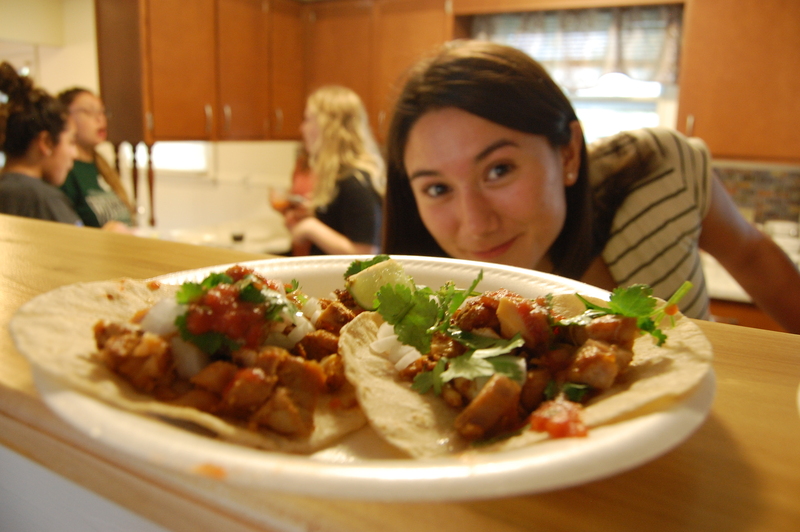 TACO TUESDAY: Selina Pohl enjoys some delicious authentic Mexican tacos provided by MAC. October 11 in Hardy Basement was the date for the guac-off/Latin night, which was the final event that MAC offered for Hispanic Heritage Month. The end goal MAC is trying to accomplish didn’t stop on the last day of Hispanic Heritage Month. “It’s my heart’s desire that our campus will be more culturally aware and culturally competent, [and] that we will thrive of off diversity,” Singleton said. The hope for Hispanic Heritage Month to start a tiny spark around campus –which at the end can finally evolve into a diverse community– was big on Singleton’s mind. He also mentioned that there will be other times for other minority groups to be celebrated and embraced on campus. He said encouraging people to come to the events and to the Multicultural House is a huge step into a more diverse campus, and creating a safe space for people to come together and interact with and learn about each other despite their differences is something that God has called us to do.